Comparing a sales force to those of relevant peers leads to many opportunities to improve performance. Making the Number will show you and your sales team how to crush the competition. The authors take readers through their five-step methodology, showing how to select metrics; gather, compute, and compare external and internal data; and then actually use the data. 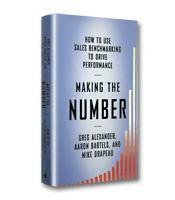 Whether you’re a sales rep, a manager, or a CEO, this book will show you a better way to make your number. Why sales benchmarking should replace the concept of sales as an art. How sales benchmarking can increase company profits. How to increase a salesperson's annual sales. The five steps to effective sales benchmarking. How to overcome objections to sales benchmarking within your organization. How to overcome implementation obstacles to sales benchmarking. How other companies succeeded with sales benchmarking.